A few weeks ago I got the opportunity to travel to New York and grabbed it! I lived there during the summer of 2008, while on a J1. I had an incredible time and fell in love with the place. It constantly changes and never sleeps- it is absolutely infectious. I hadn’t been back since The Silver Chicken hatched, so I was more eager than ever to discover the best and most interesting food spots I could find. I arrived in on a Monday evening and left on a Thursday evening- so I tried to cram in as much as possible. The first spot I ate in was Bubby’s in Brooklyn. 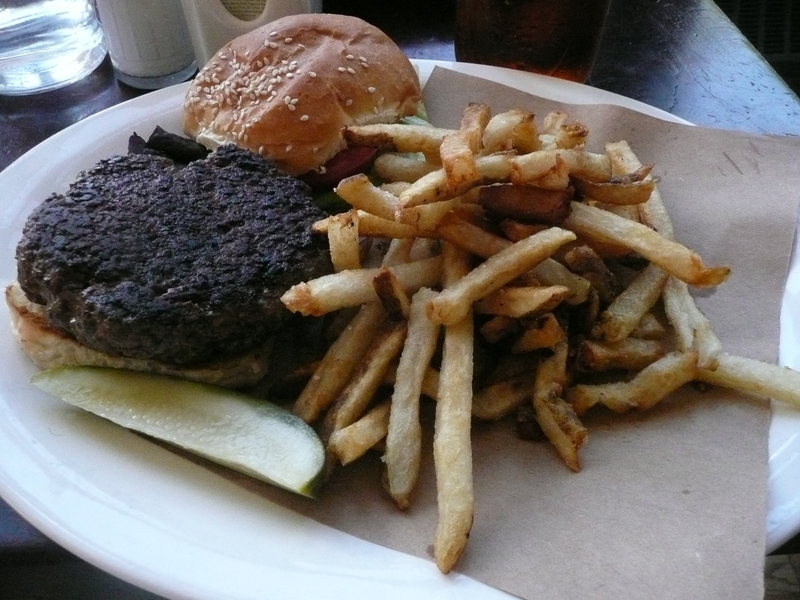 It describes itself as ‘American Cookery’ and has a decent choice on the menu. Slightly flagging from the flight, I went for a burger. It was good. Served with excellent stringy chips, a wedge of gherkin (more places should do this). It went down a treat. It’s a cool restaurant, with a slightly vintage theme. My sister who lived nearby assured me that it was a very busy spot at peak times. I was staying in the Meatpacking district. In the Jane Hotel. It was a fantastic find. Now I was a solo traveller, spending most of my day out and about, so I didn’t mind the fact that the cabin was not the most spacious room I have ever stayed in. For the price- you won’t beat this is NY if you are travelling alone. The staff were excellent, there is wonderful character to the place and it had a beautiful bar area- which I sadly only found my way into after checking-out. The Jane was a real find and one I look forward to going back to! The reason I mention this? In my current health-kick- I thought I would be virtuous on my first morning. The hotel is situated on the Hudson. So I got up, threw on a pair of ‘runners’ ( not my running ones crucially) and set off towards the new Freedom Tower which is extending at pace into the Manhattan skyline. After a very modest run- my feet were ruined, and remained so for the entire trip. Luckily for me attached to the hotel was Cafe Gitane. So after limping back, I wandered down, took advantage of the free wifi, and had a wonderful breakfast of baked eggs with smoked salmon. It was a lovely spot. You could have been in Paris- high ceilings, space between the tables and staff that broke with the traditional American approach to ‘service’. Once my feet recovered sufficiently- I set out to explore parts of Manhattan that I didn’t have the opportunity to before. Given my location parts of Greenwich village and SoHo were ripe for discovery. One find of the trip was Murray’s cheese shop. It was a temple to all things cheese- and other produce. Worth a visit. 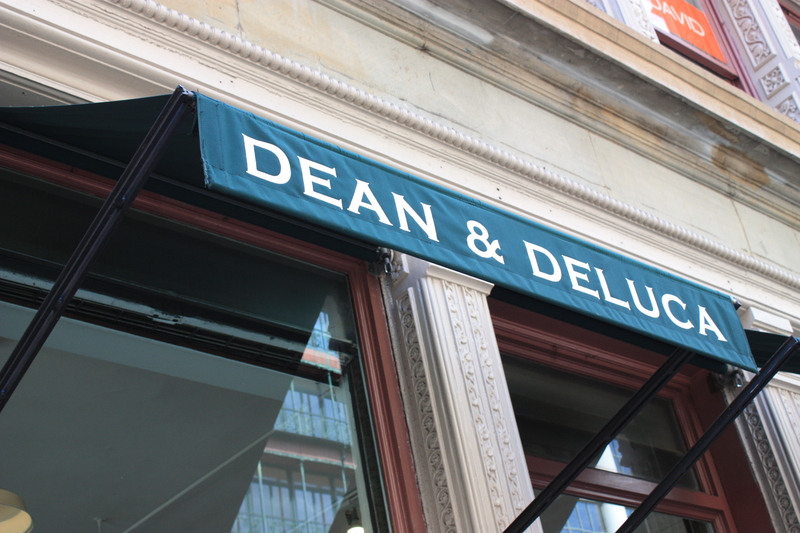 The highlight of the trip from a food-shop perspective was my first visit to Dean & Deluca. I had heard a lot about this place. Its reputation as a mecca for food lovers was not misplaced. I walked in and was speechless. I wandered open-mouthed for probably 30 minutes. All I can say is: Go! The header photo on the blog is actually taken there. As I needed some nourishment mid afternoon- I happened across the newer (posher) Chelsea branch of Doughnut plant. What can I say? When I lived in the Lower East Side I lived only a minute’s walk from their original incarnation. As a result- I frequented it with some regularity! They are not like any doughnut you will ever have experienced before! Check out their website to see the assortment of flavours. The Chelsea branch came with free wifi and friendly staff. As I was meeting some friends that night, and I ran out of time, dinner was in McDonald’s. What can I say- I had these wonderful tapas style chicken pieces. The McNugget. Little morsels of tender chicken, fried in a delicate batter. Served with a piquant sauce that had both sweet and sour notes. Stunning. Wednesday was by far the most rewarding foodie day in terms of eating. 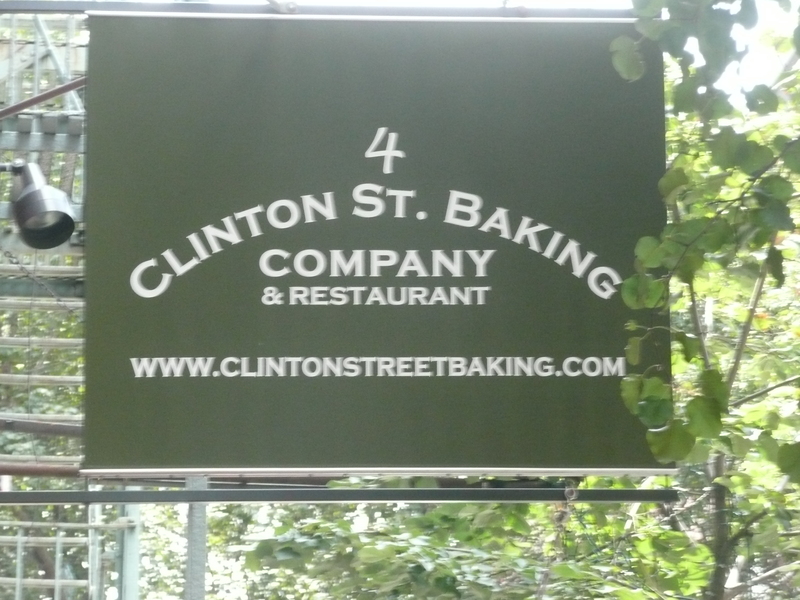 I started off by meeting the younger sibling and went on an unduly marathon walk ( I may have slightly underestimated the distances involved) to the Clinton Street Baking Company. A very well-known and very, very busy breakfast/brunch spot. As we had intended breakfast- I had my heart set on pancakes but by the time we got there a lunch/omelette seemed more appropriate! It was good, service was efficient, and I would definitely recommend it as a breakfast spot in the LES. En route here we walked by Katz’s Deli– which I am yet to try despite its fame! When people find out I’m a food-blogger, 90% of the time, their first question is: “What’s your favourite restaurant?” This is not a question I like answering I always say it depends on the company, occasion and of course budget. I will break this rule here though. I think Nha Trang is my favourite restaurant. Every time I have eaten there the food has been excellent. It is also cheap! Now this place doesn’t look much- tiled walls, you get a teapot as your water jug. The staff are also robust to say the least. If you order too much or too little, they will let you know! The sister had the crab and asparagus soup. 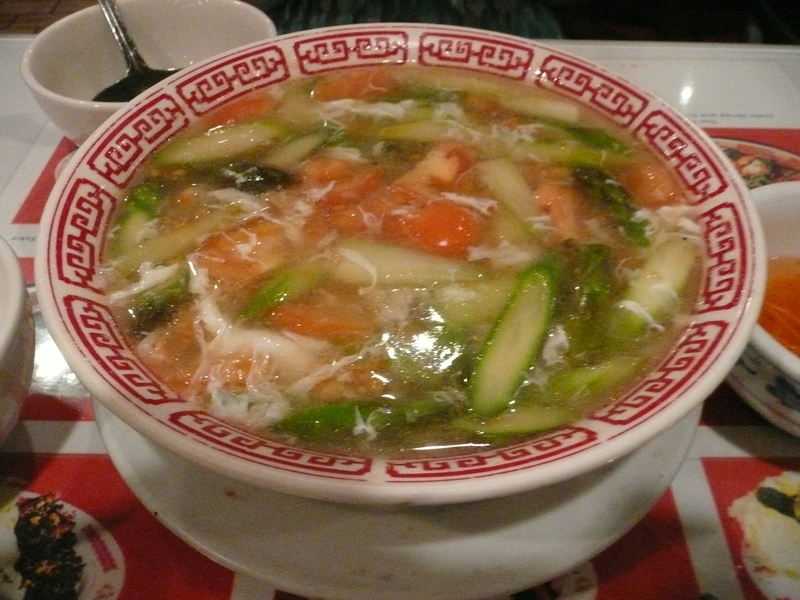 Any soup that you can eat in the middle of the summer in NYC is worthy of a mention. It’s a very fresh dish and is enormous. I also love the grilled pork and mint rolls. The pork is full of the flavour of the grill but its richness is cut by the fragrance of the mint and the freshness of the other ingredients in the roll and the dipping sauce. I also had a plate of spicy squid and it was really lovely. It was hot, had lots of flavour and the squid was very tender. The bill for the two of us came to a grand total of $26. Go to Nha Trang. It’s on Baxter Street- so if you are doing the tourist on Canal Street, it is only a short walk away. Afterwards I tried the famous Chinatown ice-cream factory– which is on the same block. I wasn’t wowed by the ice-cream, but it may have been a poor choice on my behalf- others I know have raved about it. For those of you into quirky kitchen utensils/plates/ props- take a trip to Fishs Eddy. There were so many things I wished I could have bought. Very funky plates, mugs- all sorts. As I was limited by suitcase space- it took an awful lot of restraint not to buy anything here. 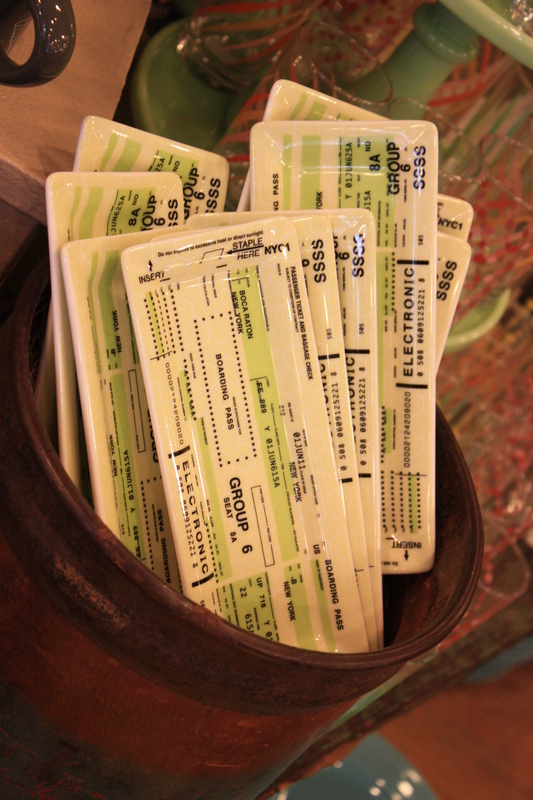 I especially liked the plates made to look like old airline tickets. Just down the road is Whisk– another nice cookery shop. It’s a great few blocks for kitchen paraphernalia! 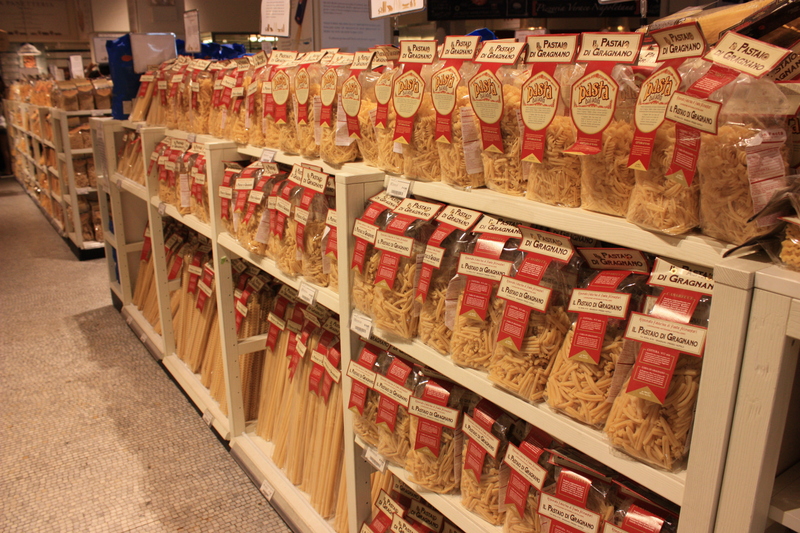 Another new-ish food shop in New York that is starting to attract a cult-following is Eataly. 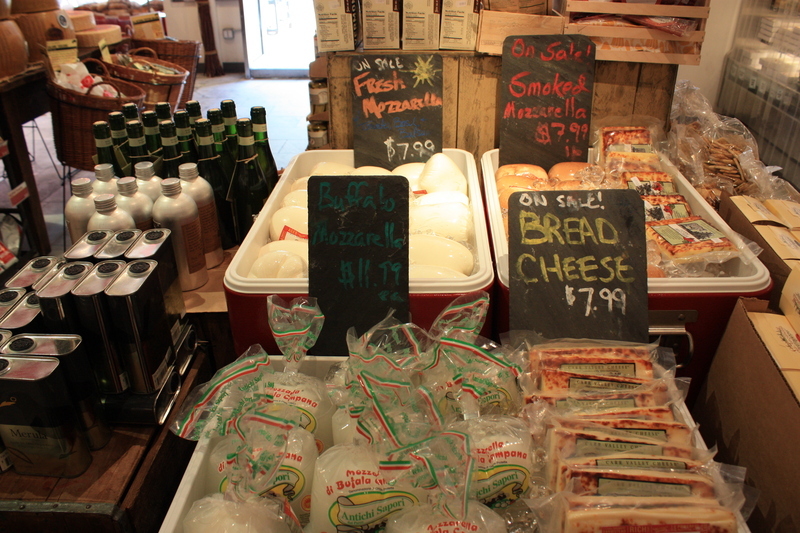 It is a massive Italian food shop. The variety of products on sale is incredible. They have everything, but as you can see in the photo they have lots of everything- countless types of pastas, cured meats, cheeses, the list goes on. The cool thing about this place is that they mesh food shop with somewhere to dine- so as you wander the aisles there are people munching away at tables. I also like the espresso bar you can stand at and revive yourself at. Something to combat the jet-lag with! As I was flying out of JFK that evening- there was one more thing I needed to do before grabbing the subway out to the airport. I wanted to visit Shake Shack. I had heard a lot of hype about this place. I hasten to add- I beat the lunch rush ( I went to the Theater District branch) and there was still a queue out the door. A nice touch was that they brought out iced drinks to those of us baking outside. The burger was good- it was everything a burger should be, good bun, well cooked and all the ingredients combined for a very pleasing taste. The shake was delicious and the fries were good. They also had a few beers from the Southampton Publick House . This is a small brewery/bar on long island which I had the pleasure of visiting a few years back. They have a beer called the double white, available in Shake Shack- a deceptive 8.5%-er. There is a small wait for the food- and most people who were there with someone else used this time to scout for a table or ledge to eat on. As a solo diner- I lacked such a scout. I ended up wedging myself in amongst another group- but they were kind enough to let me join their table. By now it was nearly time to go to the airport- but I had just enough time to meet some friends and the sibling for a pint before dashing to the airport. In fact Jack, Debs and PJ were such good company- I lingered a little too long- and let’s just say I had an energetic dash to the airport to make the flight. 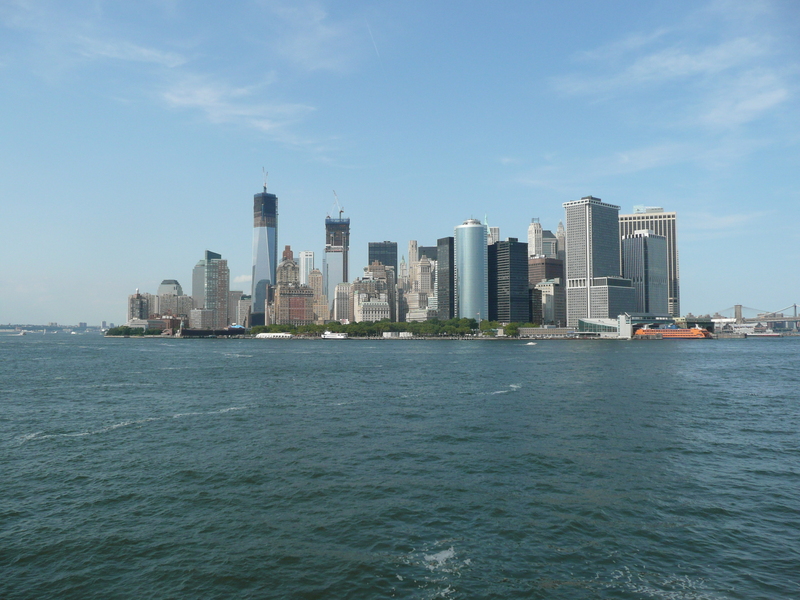 New York is one of those places, where if people have been- they typically have at least a few suggestions on where is there favourite little place to eat or shop. I’d love to hear yours, so please comment below.